Two-factor authentication adds an extra layer of security on top of your username and password when logging into HubSpot by requiring verification of the login through a second linked device, such as an SMS message or Google Authenticator. How is two-factor authentication more secure? Because two-factor authentication requires that someone logging into an account has access to a physical object belonging to the account owner only, the risk of a potential intruder gaining access to your account is much lower. 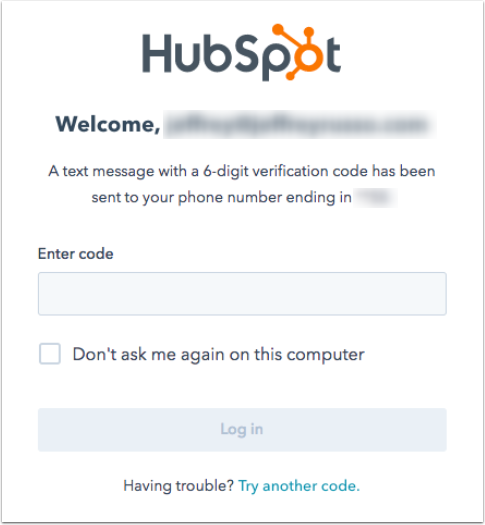 Keep in mind that HubSpot’s two-factor authentication is only enforced for logins using your HubSpot username and password. It cannot be used if you're using Google to sign into HubSpot. In the left sidebar menu, click Security. In the Two-step verification section, click Set up primary method and follow the on-screen instructions. You’ll need access to the device you intend to use as your other login method (e.g., your mobile phone with SMS or the Google Authenticator app). Once two-factor authentication is set up, you'll be prompted to enter a code that is delivered to your device. After setting up your primary method, click Set up secondary method and follow the on-screen instructions. Please note: you should enable Google Authenticator as your verification method. Google Authenticator keeps your account and data more secure. SMS verification is more vulnerable to compromise and hijacking than app-based authentication. If you lose your 2FA device, you will not be able to access your account. Following this, an account reset will take at least 48 to 72 hours. In the event someone fraudulently resets your 2FA, the 48 to 72 hour window gives you time to view the reset notification and alert HubSpot Support of the fraudulent activity. The best way to ensure you retain access to your HubSpot account is to set up both primary and secondary methods for your 2FA log in, and to generate backup codes. A combination of Google Authenticator verification and stored backup codes for recovery will give you the most secure and reliable two-factor authentication setup for your HubSpot account. In the left sidebar menu, click Users & Teams. If a user has two-factor authentication enabled for their account, you'll see a shield icon next to their email address in your users and teams. If the icon's filled in gray, the user has two-factor authentication enabled and has generated a set of backup codes. If the shield icon is not filled in, the user has enabled two-factor authentication, but no backup codes have yet been generated. What countries are supported by SMS two-factor authentication?